A Poway man and his son escaped their burning home early Sunday morning, but the fire claimed the life of one of their cats -- a "huge loss" for the family, he said. 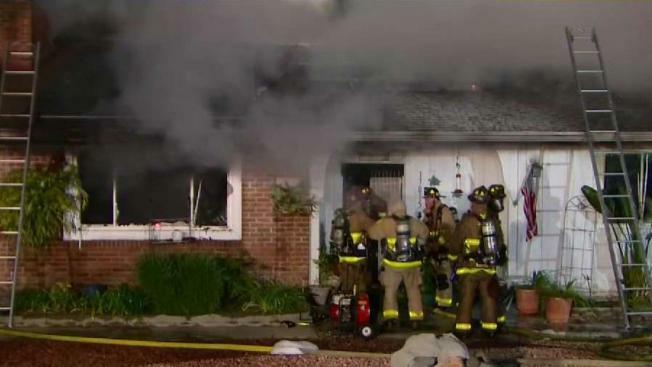 Greg Heer awoke to the sound of a beeping smoke alarm at 3 a.m.
Footage of the scene obtained by NBC 7 showed flames and smoke shooting out of the roof. Heer, 72, and his 34-year-old son quickly rushed out of their home. The family had two dogs and two cats, and Heer said while he, his son, and his dogs are okay, one of his cats unfortunately died in the fire and the other is still missing. “It’s horrible. It’s unbelievable. I can’t believe it happened to me,” Heer said. Heer told NBC 7 he wanted to re-enter his home to find his cats and retrieve his keys and wallet but couldn’t due to the heavy smoke. During the commotion, Heer said his hair was partially singed. “We couldn’t go any further into the house, so we just came outside and waited for the fire department to show,” he said. The San Diego Sherriff’s Department and the Poway Fire Department responded to the scene on St. Andrews Drive. It took more than an hour to fight the challenging blaze. Deputies evacuated several neighbors and six people from a nearby assisted care facility as a precaution. Shortly after, crews gave them the OK to return to their homes. Heer’s mother passed away last November, and boxes of her belongings were damaged or destroyed in the fire. Heer also said a lot of his photos and collected memorabilia were damaged. “You know, you go to sleep last night, looking forward to -- right now watching the Masters golf tournament -- and now, everything’s gone almost,” Heer told NBC 7. Heer has lived in his home for more than three decades.